It is inevitable – most business owners and entrepreneurs will need to raise capital for their business at some point in time. Whether you need funds to start your business, have to finance expansion costs, or simply want to invest in different elements of the business, raising capital is often an integral part of growing your business and reaching your goals. From traditional bank loans to business credit cards, there are a variety of borrowing opportunities for entrepreneurs and small business owners. However, not all lending options are created equal, and it is important to find the one that best meets the needs of your company. 1. Business owners can use a business line of credit to maintain inventory. Having a well-stocked inventory can mean the difference between struggling to get by and surpassing all of your sales goals. A well-stocked inventory allows you to reach your sales potential by always having the products on hand that customers need. This is especially important during the holiday season when competition is fierce and consumers expect quality customer service. However, business owners often don’t have the funds to replenish their inventory if they are waiting for invoices to be paid or have just experienced a period of slow sales. A line of credit helps solve this problem by allowing entrepreneurs to access the funds that they need anytime. With these funds, business owners can ensure that their inventory is well-stocked, and they always have just what the customer wants at all times. 2. Entrepreneurs can finance repairs, maintenance, or new equipment costs. No matter how diligent you are about cleaning and maintaining your equipment, it is bound to need maintenance or repairs at some point in time. If your equipment is older or outdated, you may even be thinking about replacing it to operate more efficiently. Unfortunately, breakdowns don’t always happen when you are expecting them. With a line of credit, you can get the money that you need to repair, maintain, or replace any equipment in your facility. This quick access to funds allows you to reduce any downtime caused by broken or malfunctioning equipment, helping your business get back up and running in no time. 3. A line of credit can be used to hire and train new or seasonal staff. Many industries such as retail and hospitality experience ebb and flows in sales due to seasonal demand. When this happens, business owners often have to hire additional seasonal staff to help meet the growing demand. Not to mention, these industries often have a higher turnover rate, which can leave businesses stranded when employees leave unexpectedly. A line of credit offers business owners the access to capital that can be used to hire and train new or seasonal staff. Though hiring and training staff requires a significant investment, it tends to pay off in the end when you have happy customers who are repeatedly returning to your business and telling their friends about the exceptional customer service they experienced. 4. Business owners can also use funds to launch new or seasonal marketing campaigns. Marketing campaigns often require an up-front investment that pays off over time. Sometimes companies may not have the up-front costs ready when big shopping seasons like the holidays roll around, especially if they have just experienced an off-season or a period of slower sales. Business owners can use a line of credit to access the funds they need to develop and implement new marketing campaigns. This allows them to bring in more customers during the busiest times of the year without having to worry about the challenges of a limited marketing budget. Business owners can also use these funds to redesign or update their website as well as hire a marketing professional to handle any seasonal and year-round marketing needs. 5. A line of credit helps business owners be prepared for surprises. One of the best parts about a business line of credit, as compared to other lending options, is that it allows business owners to be prepared for any surprise expenses that may arise. With a line of credit, you have instant access to funds when you need them. If a piece of equipment breaks right before an important job, you can use a business line of credit to replace it. If you find yourself needing to restock inventory before invoices have been paid for previous purchases, you can use a line of credit to access the funds you need. When too many staff members quit unexpectedly, a line of credit will help you hire and train new personnel before your customer service is affected. No matter what surprise expenses you may encounter, a business line of credit gives you the peace of mind in knowing that you have the capital you need to handle these challenges should they arise. 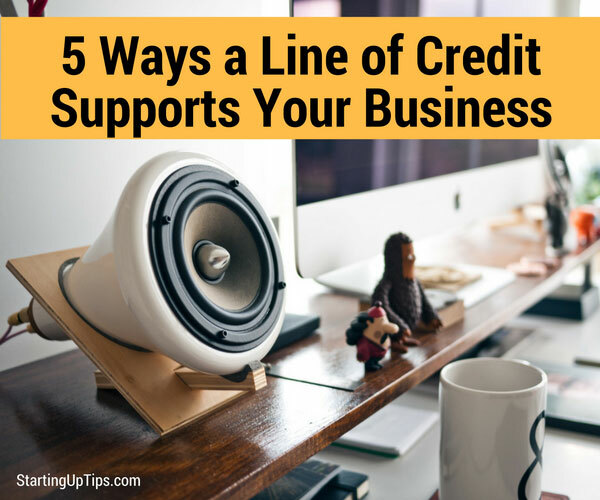 Overall, getting a line of credit for your business can help your company survive in the slow season and thrive year-round. This type of funding can be used for companies big and small from any industry. With so many ways to utilize a business line of credit throughout the year, this is a great option for brands who want to invest in inventory, equipment, and other things that will help them grow their business.